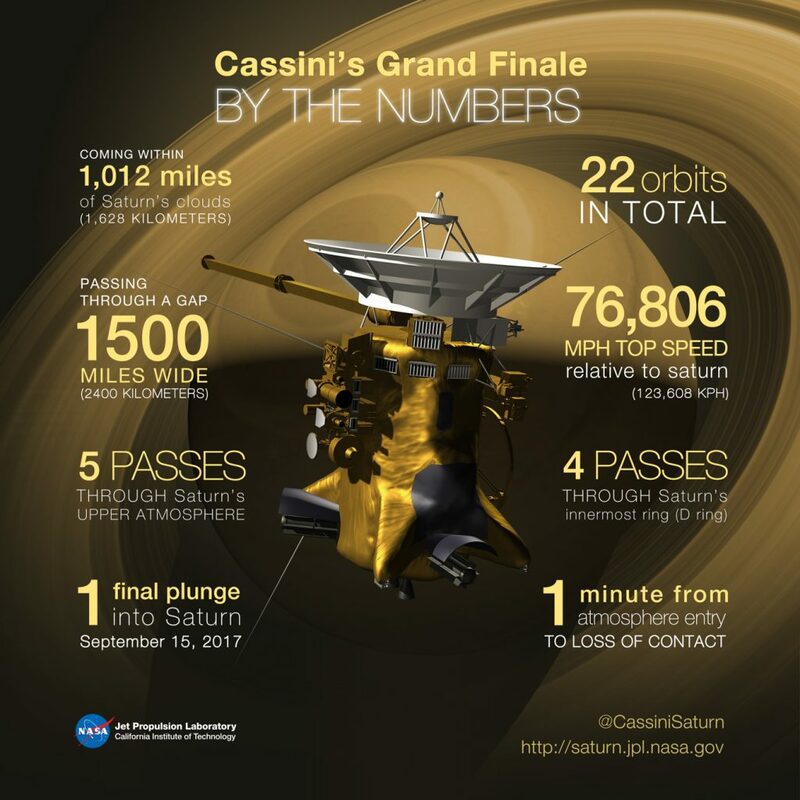 A complex coordinated ‘dance’ between ESA and NASA tracking stations is following Cassini during its Grand Finale. In Cassini’s Grand Finale orbits – the final chapter of its nearly 20-year mission – the spacecraft travels in an elliptical path that sends it diving at tens of thousands of kilometers per hour through the 2400-km space between the rings and the planet where no spacecraft has ventured before. May, June and July have been busy months for Cassini, as a series of complex ground-station tracking passes involving ESA’s Deep Space Antennas (DSA) and NASA’s Deep Space Network (DSN) captured a series of Grand Finale radio science passes. The Cassini mission has performed radio science observations many times during its time at Saturn. Previously, the mission relied solely on the antennas of NASA’s Deep Space Network for these observations. Now, the addition of new ESA tracking capabilities is helping provide the continuous signal reception needed during Cassini radio science activities. But it means the two agencies’ networks must work closely together. ESA deep space ground stations began working with Cassini last year, conducting a series of test ‘passes’ – a ‘pass’ occurs when a spacecraft arcs into line-of-sight visibility above a station and continues until it disappears below the station’s horizon as Earth rotates – using their large, 35-meter-diameter, 630-tonne antennas pointed with exquisite accuracy at Cassini in the sky, listening for the craft’s call from Saturn. 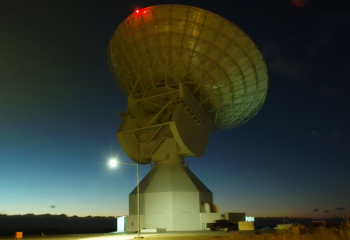 In an initial test on 10 August 2016, ESA’s tracking station at New Norcia, Western Australia, received signals transmitted by Cassini across 1.4 billion km of space – the most distant ‘catch’ ever for an ESA station. Now, during the 22 ‘inside-the-rings’ orbits of the Grand Finale, ESA stations are putting into practice the experience learned last year and are receiving Cassini’s signals, focussing on radio science gravity and ring occultation measurements, and delivering the data received to scientists in the U.S. and Europe for scientific analysis. The gravity experiments aim at measuring Saturn’s gravitational field with an unprecedented level of detail in order to gain insights into the planet’s interior structure, and at constraining the scenario of formation of Saturn’s rings by determining the rings’ mass. Variations in Cassini’s orbit – even minute ones – from its expected trajectory can be detected by analysing the Doppler shift in the craft’s transmitted signal, enabling the tugs due to gravity to be studied and measured. The radio science occultations aim at analysing the fine-scale structure of the rings and the physical properties of its particles. Radio science occultations occur when the signals that Cassini transmits to the ground stations pass through the rings – affecting the signals in certain ways that can be studied and analysed. For six of these closest approach passages (the last one to occur on 19 July), the spacecraft had its High Gain Antenna pointed toward Earth to perform radio occultation measurements of the rings and the radio science gravity experiments. These radio tracking passes run for very long periods – lasting up to 37 hours, meaning that no single ESA or NASA station has visibility of Saturn for the entire pass. As mentioned above, a pass starts when a spacecraft rises into line-of-sight view above one local horizon, seen from the station’s location, and continues until it drops out of sight below another horizon, the movement being due to the station rotating with the planet (good example with pictures here from when an ESA station tracked NASA’s Juno Earth flyby in 2013). Since the Earth is rotating, a routine tracking pass link from any single ground station to a planetary mission typically can last only a few hours – but Cassini radio science needs much longer. In comparison, for Earth missions (which typically orbit Earth 14 times per day), passes last just a few minutes! For Cassini radio science, receipt of the craft’s signal must be uninterrupted in order to obtain measurements of Saturn’s gravitational effects on the spacecraft without gaps. To achieve the extra-long passes that Cassini needs, and since we can’t simply slow down Earth’s rotation, a series of very technically challenging, real-time handovers of Cassini’s received signal was planned between multiple ESA and NASA ground stations. 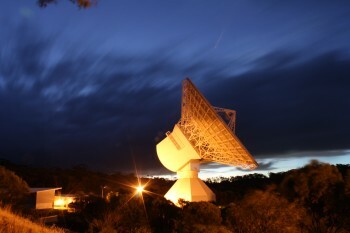 This effort involves antennas located in Argentina (ESA), California (NASA), Spain and Australia (ESA and NASA). “We are now getting into a new mode of radio science, giving much more accurate measurements of gravitational effects compared to previous observations where the effects of ring density on radio signal propagation were the main topic of study,” Daniel Firre, ESA Service Manager for NASA cross support. The handover plan between antennas to receive the spacecraft’s signal has been organised to provide the necessary continuous coverage, and has necessitated very close technical and organisational cooperation between the two networks across multiple continents. Incredibly, there can be up to seven stations involved in a single pass. The graphic below illustrates how each ground station tracks Cassini’s signal during these passes. Each station is represented by a different colour. Cassini’s signal is tracked as Saturn (and hence Cassini) rises and sets in the sky above each station. Note that the optimum angle for the ground station antennas is between 25 and 30 degrees above the horizon; below this “cut-off angle,” there are too many things that could disturb the communication link with the spacecraft. As a result, ESA’s stations in the southern hemisphere are in the best position to receive the Cassini’s signal due to Saturn’s location in the sky right now. This can be clearly seen in the diagram, where M(adrid) and G(oldstone) have visibilities of around 30 degrees, while Malargüe and New Norcia are at nearly 80 degrees. Cassini is a sophisticated spacecraft; it can receive signals in X-band and transmit in S-band, X-band and Ka-band (details on these frequencies here). For the radio science passes, Cassini is transmitting and the stations on Earth are receiving; every time one receiving station rotates out of view, the succeeding station picks up, and there is a five-second overlap to avoid losing contact (note that the coloured coverage arcs in the graphic above overlap). Not all the stations can receive all three of Cassini’s frequencies; nonetheless, the station-to-station handovers are so well coordinated that it is always possible to receive at least two of them. Saturn’s gravity field and the mass of the rings are detected by means of what are called “range rate” measurements – basically, measuring the rate at which the distance from the ground station to the spacecraft varies. These measurements are enabled by Cassini’s on-board X-band radio system, along with the five DSN and two ESA stations working in tight coordination. Gravity field measurements are obtained by comparing the detected speed of the spacecraft (technically, its radial velocity, with accuracies of about 0.05 mm/s) to a model of the spacecraft’s orbit that takes in consideration the effects of the Doppler shift. Cassini radio science observations will provide crucial clues on how and when Saturn and its rings formed, as well as their relation to its moons: a large ring mass would allow the rings to be as old as the Saturnian system, formed 4.5 billion years ago, while a smaller ring mass suggests that the rings must be much younger, possibly formed by the breakup of a large comet or small moon. As described above, occultation observations happen when the rings partially block Cassini’s radio signals enroute to Earth. During the Grand Finale, these observations are taking advantage of the spacecraft’s ultra-close perspective on the rings, which allows the radio signal to systematically sweep across the ring system from quite close. The campaign tracked occultations during the six radio science gravity orbits (the so-called “RSS orbits” when Cassini’s radio science subsystem was active) and two “Ring Segment” orbits (orbits 276 and 282 – see the Grand Finale orbit guide for details). The radio occultations are short in duration (less than 26 minutes), starting almost immediately after Cassini dives through the ring plane, and they cover the entire main ring system. The technique can measure up to three frequencies, profiling the ring structure and constraining the structures’ physical properties. 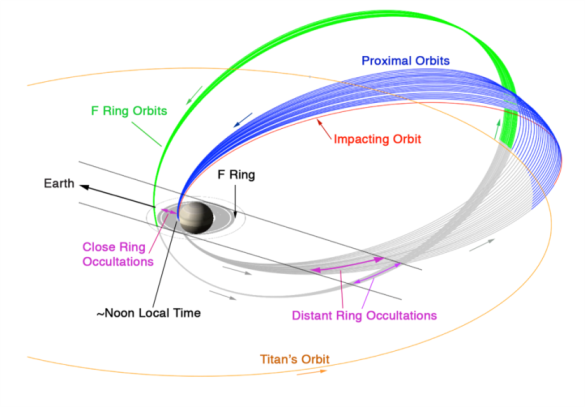 The collective ring coverage of the RSS Grand Finale occultations is unprecedented in the Cassini mission. Never before has such a close occultation observation technique been attempted. 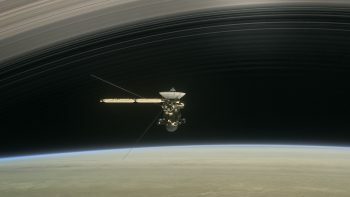 “By marshalling the two agencies’ stations together, the overall science return from Cassini is being significantly enhanced, as their sensitive radio ‘ears’ can listen for signals from the craft as it is tugged by gravity or as the signals pass through the rings, providing additional, important information to help us understand this incredible system,” says Nicolas Altobelli, ESA’s Cassini-Huygens project scientist. These powerful scientific insights are being made possible through intense coordination and cooperation between the ground stations of ESA and its NASA partners – truly a technical and expertise tour de force within a Grand Finale. To understand Doppler better, listen to this audio sonification of the radio-frequency Doppler shift in the signal transmitted by ESA’s Mars Express as it flew past martian moon Phobos in 2013. The change in pitch you hear is caused by Phobos’ gravity tugging on Mars Express. The 65-meter Sardinia Radio Telescope (SRT) also takes part in the campaign, isn’t it? First class knowledge for the lay-person. Well done. Fairwell CASSINI !!! ….. take Good Care Of Her, SATURN.